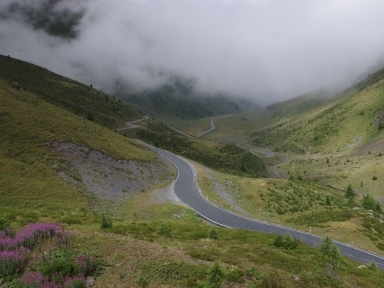 Obvously, the ten passes of this web site are but a small sample of all climbs that Switzerland offers to road bikers. Two regions with a high density of interesting ascents are Central Switzerland, which includes the Susten, Furka, Nufenen, St. Gotthard and the Grimsel Pass, and the Canton of Graubünden with e.g. Albula, Bernina, Flüela and Maloja Pass. All climbs of this website are situated in these two regions. The hardest one is the Umbrailpass located on the border between Switzerland and Italy and with 2501 meters the highest mountain pass in Switzerland. Common features of the ten ascents are the generally very good state of the road and the uniformity of the slope of the steep sections. Many roads are wide and rather busy.